The period right after Pesach (Passover) and just before the height of the summer is lovely in Israel. The days are nice and sunny though the evenings can be quite cool and one can still snuggle under a duvet at night. The weather is nice enough to spend a day at the beach but the water is way too cold for normal people like me to swim in. :) The wild flowers are slowly disappearing in the heat and the farmers start to harvest the wheat from the fields. This is also the time that religious Jews count the Omer. From the second night of Pesach for 49 days (seven weeks) right up to the Jewish holiday of Shavuot. They will count the days verbally every evening and in the end have the right to recite a special blessing. If one has missed counting just one day, you will not be able to say the blessing. You can read about the counting of the Omer at Leviticus 23:15-16. The word 'omer' itself is a word for a measurement such as 'liter' or 'kilogram'. 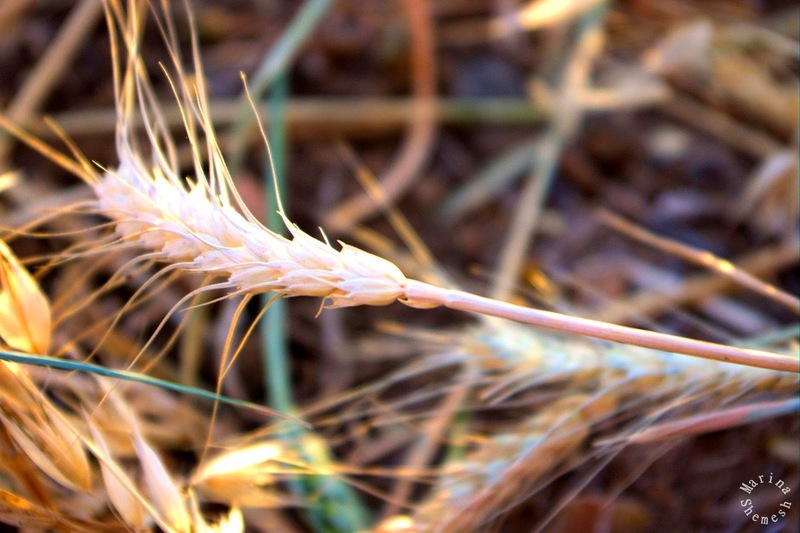 On the second day of Pesach an omer (or sheaf) of barley was sacrificed at the Temple in Jerusalem . The holiday of Shavuot is special because it marks the date that the Jews have received the Torah at Mount Sinai. Counting the Omer not only shows the connection between leaving Egypt ( Pesach) and receiving the Torah but it accents the thrill of receiving the Torah. Just think of a child counting the days to her birthday or the summer vacation. Even though Jews are looking forward to Shavuot and the holiday that marks the receiving of the Torah, the Counting of the Omer period is a sad time. Religious men go unshaven, women and men do not have haircuts and no weddings or parties are held . This mourning period is to remember a plague that took place during the lifetime of an important rabbi, Rabbi Akiva. He lived in Israel when the country was part of the Roman empire. There was a break in the plague on the 33rd day of the Omer and on this day the mourning practices are lifted. This is also considered a 'lucky' date to have a wedding. Legends have it that 24, 000 students of Rabbi Akiva died during the plague because they treated each other with disrespect. As I have mentioned before, the counting of the Omer period, or just 'Omer period' is the time of the wheat harvest here in Israel. I always think of the story of Ruth and Naomi (that is told in the book of Ruth in the Jewish Bible) when I see the golden wheat fields. The book of Ruth is read during the Shavuot holiday. Naomi and her daughter-in-law Ruth were so poor that Ruth had to gather the wheat from the corners of the field. Farmers are required not to harvest this wheat but to leave it for the poor people to gather. The owner of the field, Boaz, saw and fell in love with Ruth and eventually they married and had a son called Oded. Oded was the grandfather of King David. For me the sad story of the 24,000 students of Rabbi Akiva and the happy story of Naomi and Ruth teach us to be kind to each other. We should treat each other with respect no matter how different, poor, geeky, rich, clever, and even popular we are from each other.